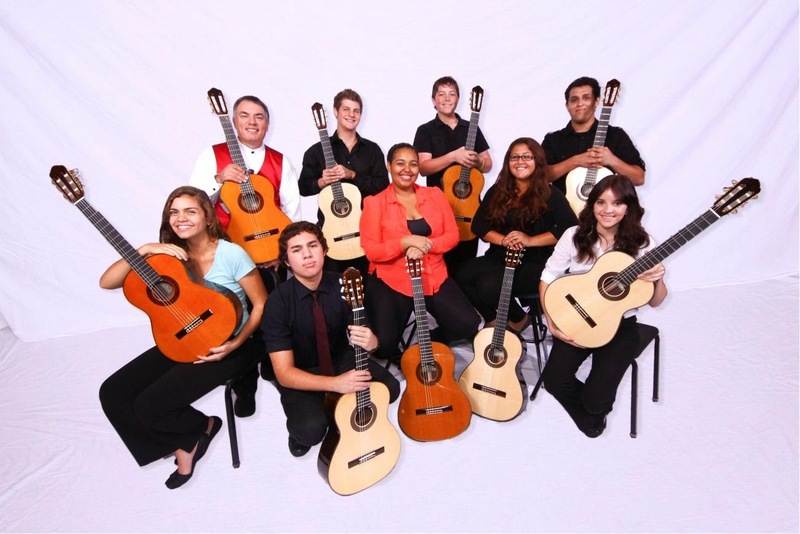 Since the fall of 2007 it's been a rapid climb, the growth and maturing of our guitar program. After a year and a half to get my bearings in teaching guitar, (being a trained percussionist and saxophonist), I found myself opening and walking through a new door into a different and ultimately better world. Creating an all new guitar program from scratch was challenging. My school administrators never once told me what to do with my classes or how to teach them. I am blessed to have their unfailing support, allowing me to freely push my teaching and to find answers (and the right people) to make my students and program better. And, while I had a vision of what the Freedom High School Guitar Program could become, I never imagined everything would move forward so well and so quickly. 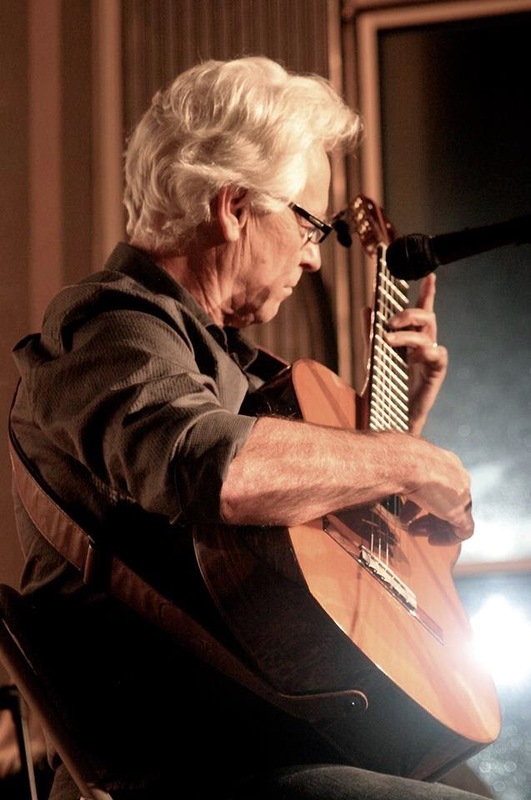 After having countless guitar-centric questions answered by many incredible and wonderful guitar colleagues and professors from all over the U.S., I worked my students hard with lots of teaching, challenging rehearsals, clinics, master classes, and well over 100 concert and festival performances. 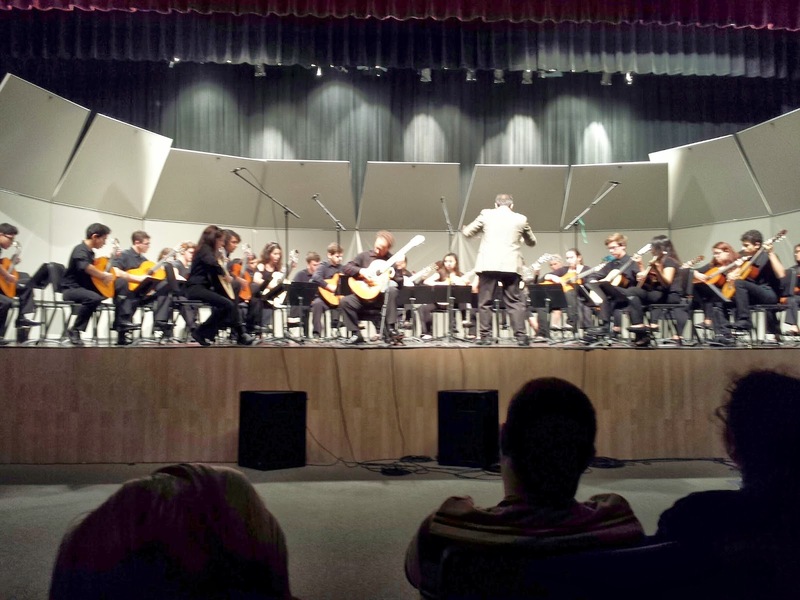 We arrived 6 years later as a top notch program where in early 2013, the FHS Guitar Orchestra performed in concert at our Florida Music Educators Association All-State Music Conference and a few months later in New York, at the Long Island Guitar Festival. Though we are now known on an international level, we (teacher and students) also realize there is so much incredible guitar music out there to discover, learn and master. Our program musically, artistically, and personally can never rest in the past and always will need to search, learn, grow and continue to move forward. 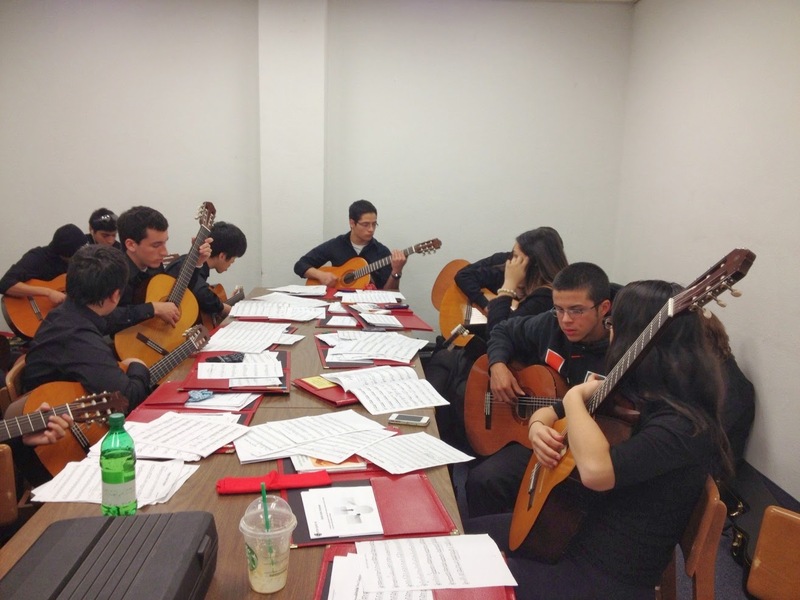 The next stage in filling the "needs" and "gaps" of my program was to have a private study guitar class; a conservatory for students who plan on preparing and auditioning for college. Again, my school administration was very supportive by adding this new layer of class to my program. For the past few years I was painfully aware of the limitations regarding the guitars we currently have. They were entry level models and were used by my students...all 190+ of them...six classes a day...180 days each school year. My beginners fared well; my burgeoning number of advanced students are now playing very complex, challenging music on instruments that no longer matched their musical and technical ability. We needed something more...something better. In the spring of 2013 I began the "Great Search" to find a respected guitar luthier that produced not only quality guitars, but also were "economical". Among the different responses I received, Dr. Stephen Robinson (Stetson University) recommended several luthiers for me to contact. "You should contact Kenny Hill and check out his guitars. There is a growing interest in the Guitar Community about his NEW WORLD line of instruments", he said. After visiting his website to see artist videos of his guitars used in performance, visiting a few shops to try different instruments and personally talking with Kenny about his guitars, I was immediately sold. It was very evident that Kenny's instruments sounded not only incredible, they were affordable, and made to his exacting standards. That instrument is the all solid NEW WORLD Player Series. "So, how many do you think you will need?" Kenny asked. "Yes, ten of the P650 size. What do you think? Should I get all Cedar or all Spruce guitars?" "I think five Cedar and five Spruce Player Series models would be a great blend for your students. It would be a great sound, especially if you play together." "You are right. It would be a wonderful sound together. We need to get them quickly though." "Is there any possibility to take delivery by August, before the next school year begins?" "Hmm.......let me check production orders in the factory. I'll get back to you." After that things happened very fast. In the span of only six weeks, Hill Guitars became a vendor with our school district (this was a major purchase), secured vendor numbers and put funds in place, shipped the guitars from overseas to California, went through his shop for Kenny's personal set-up, and shipped all ten to our school by mid-June. It was a very happy day when they arrived! Several of my students and a few colleagues were on hand to help open the boxes and try each one! Hill's NEW WORLD Player Series was the only choice to what we needed; an affordable, professional entry level guitar that to me, rivals many other models two to three times the price. With both solid Cedar and Spruce models, they are wonderfully crafted instruments. The beauty and transparency of tone in each guitar was very consistent with one another. It was obvious that the attention to detail in each guitar from construction to finish was very high. Again, made to Kenny's exacting standards. Aside from daily practices and rehearsals, the instruments were recently used by our students for high profile events including a clinic presentation at the FMEA All-State Music Conference, the Orange County Public Schools All-County Honor Guitar Festival, and accompanying William Kanengiser's performance of Shingo Fujii's "Concierto de Los Angeles for Solo Guitar and Guitar Orchestra". Everywhere we use the Hill Guitars, there is genuine interest on where and how they are made. Of course, everyone appreciates its warm tone, sonority and ease in playability. Even one of my senior students who will major in guitar performance in college next year purchased a Hill Performance model last November; he too sold on the quality of instrument Kenny creates. The lattice bracing and two tone holes at the top of the guitar body by the neck were big selling points! 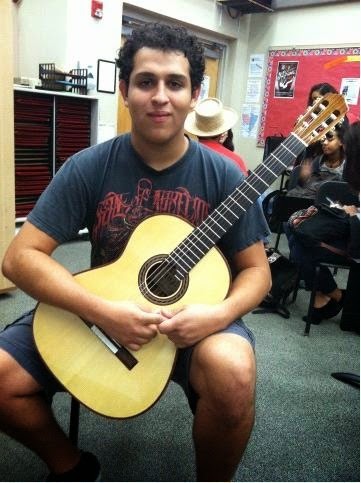 The NEW WORLD guitars are a wonderful addition to the Freedom High School Guitar Program. My students are now able to better explore and properly prepare music without the need to "struggle" on an inferior instrument. In the coming years we will add more Hill Guitars to our growing inventory. Kenny runs a wonderful and quickly growing company in Hill Guitars and should be proud of the instruments that he is creating. The luthier techniques he uses produce guitar of the highest quality. My students love playing on his instruments! As the Director of Guitar for Freedom High School, I am proud to say we fully endorse the Hill Guitar Company and the NEW WORLD Player Series model of guitars! The 2014 Santa Cruz Art of Guitar Festival is a wrap. All of the shows, receptions, concerts and demos are done, and the festival could not have been better. Jayme Kelly Curtis's vision was fully realized and exceeded. The pulse of interest and excitement has reached not only all around Santa Cruz, but also much more globally, I've had interest and comments coming in from all over the country. Our participation as Hill Guitar has been quite satisfying. When Jayme first told me about the idea 3 years ago the first thing that jumped into my mind was to put together a guitar making demo. And we did it. For the February 7th event at the Museum of Art and History my sons and I moved part of our workshop into the museum atrium and built guitars in public, while many of the best musicians of Santa Cruz took stage to demo the varied fine guitars of our local luthiers. More than a thousand people turned out that evening and it was wonderful to see how intrigued they were watching our craftsmen at work, neck carving, side bending, the inside details of the instruments, and French polishing. The boys did an amazing job just doing their work, in addition to explaining their processes and reasons, and glowing with enthusiasm. I'm very proud of them. The two concerts we sponsored were also grand. First Evan Hirschelman opened a show sharing the bill with with Bill Coulter and Alex de Grassi. My God, I've heard Evan play many times, but he always astounds me with the power, imagination and virtuosity of his compositions. 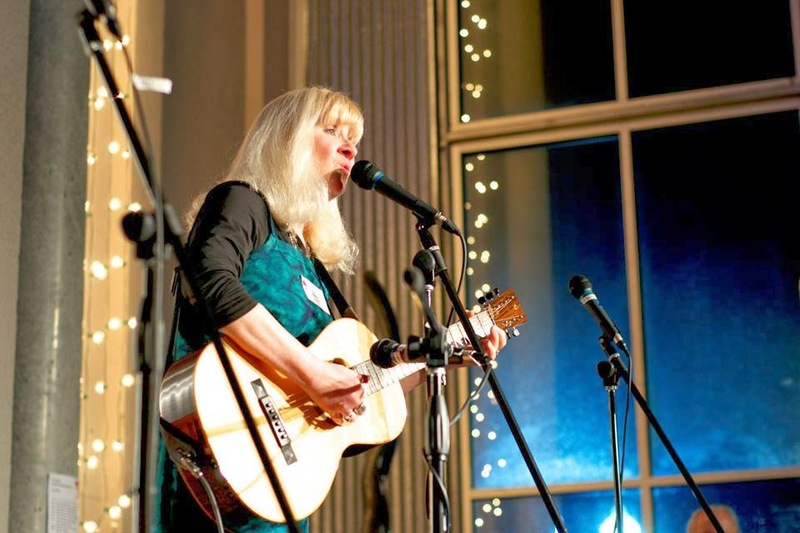 That sold out show was amazing, and we actually arranged a second house concert so we could hear it all again. Then 4 days later the Athens Guitar Duo came in from Georgia. I had heard a recent CD of theirs, but never actually met them, and once again, their playing and their repertoire was so beautiful. Their performances were very satisfying, moving, and it is very gratifying to hear our instruments do what they are made to do on such a lofty level. Thanks to everyone who came out. We live in an amazing community. This show focusing on luthiers of Santa Cruz was much more than that, it became a stand in for all of the creativity and beauty that our neighbors and friends and family support here all the time. For all of the luthiers I know here, the business is necessarily world wide. In fact lutherie in Santa Cruz is essentially an export business. 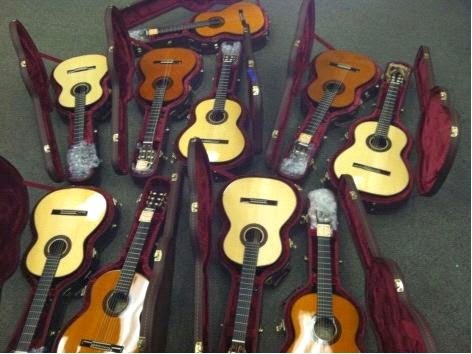 Though we sell a few instruments locally to local musicians, I think 90% of hand-made guitar sales will go to other parts of the country or the world, which helps keep the Santa Cruz trade balance positive. It is a privilege to be based in a place where art and ideas and creativity can be so well cultivated and appreciated. It is good to see all of our colleagues getting together, and realize how the love of the work still infects us all, maybe even stronger than when we began. Thank you Jayme, what a great idea you had. And also special thanks to Rick Mackee, Nicole Ward, Rob Blitzer, Bill Coulter, Jim and Renee, my kids, and all the others who did so much behind the scenes.